Small hand cymbals that are struck edge to edge at right angles to produce a very penetrating sound. They are used in the 'Ceremony of the Hungry Ghosts', and to signal that a Buddhist Teaching is about to take place. The Tingsha is sounded at the beginning and end of meditation sessions. They can direct or push energy, and can be used to diagnose. They have an attribute which is to 'fill' emptiness. Found primarily in the Buddhist regions of Asia. Special Note: These small cymbals are known to the Bon tradition as Nagani Bells. The Bon tradition predates the Buddhist one by thousands of years. Most likely the Buddhists 'borrowed' this ritual piece from the Bonpo. In this case, the bells are used for calling the Naga, or the earth spirits. According to the Bonpo, there are times when these bells are used, and at other times they are not sounded. This has to do with the Lunar Calendar. 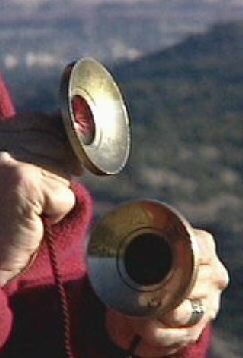 Because the Naga and their energy have great influence over our lives, these Bells should not be used by people who have not been trained according to the Bon tradition.